A classic clear 18oz Pub style pint - Featuring the Irish Harp - an idea gift for anyone! The harp is the official emblem of Ireland and it is unique to have a musical instrument used as a symbol to represent a country. Dating back to medieval times, the harp was at the epicentre of Irish society until its decline at the end of the 19th century. A harpist in those times commanded high social status until the chaotic 17th century saw the breakdown of Gaelic society and the harp was then adopted by new settlers and itinerants. 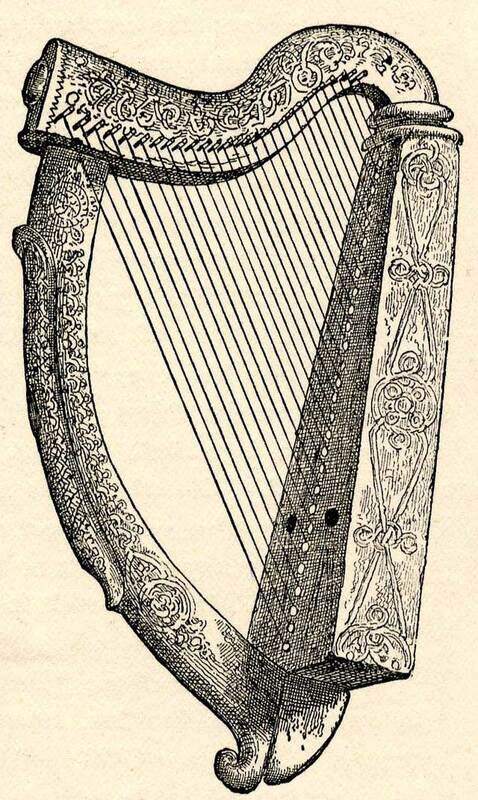 The harp in the 20th century was used by the Irish Free State as its official seal. The harp which is used is meant to represent the Trinity College harp thought to belong to Brian Boru. In 1928 the circulation of Irish coinage saw Percy Melcalfe’s harp design become the symbol adopted by the Irish Free State. The signing of the Anlgo-Irish treaty saw Ireland as an autonomous state between 6 December 1922 and 28 December 1937 and used the harp as the official seal. The harp was featured on Irish flags prior to the Republic adopting the tricolour. The Harp is engraved on the official seal of the President of Ireland. The President's flag consists of a golden harp or with silver strings on blue (azure). The harp is used by the Government, its agencies and representatives in Ireland and abroad. The harp is also featured on the reverse side of all Irish Euro coins. It can also be seen on naval flags, court houses, post offices and embassies.